This baby shower wreath was so fun to make and didn't take much over 45 minutes to finish. And, the best part was, I got to use my glue gun! I love my glue gun and oftentimes get glue all over the place - but it is so fun to use and makes crafty so easy! The pictures below outline my fun crafting project that I thought of while strolling the aisles of Hobby Lobby. That is where most of my inspiration comes from! My youngest daughter and I could camp out there for days! This baby shower wreath was so easy to make! 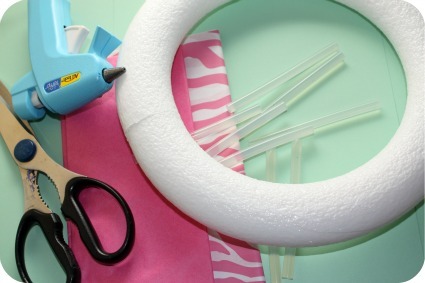 All you will need is a Styrofoam wreath, tissue paper to match the theme or color scheme of the baby shower, scissors, and a glue gun! The free printable "sweet baby" template is below"
Using your scissors, cut the tissue paper into small squares. I cut approximately 2" squares by just eye-balling it. I didn't use a ruler to measure. You don't have to be exact. As long as they are around the same size, you will be fine. 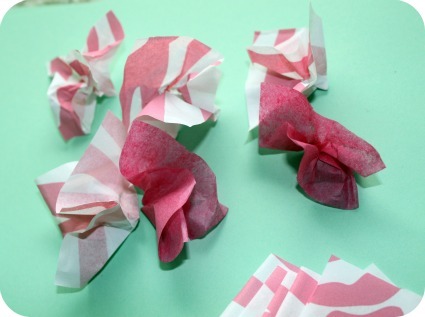 Pinch the tissue paper from the middle and gently twist it so it is crinkled a bit. 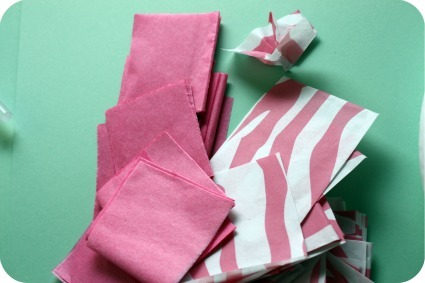 If your tissue paper has a design on one side, of it (like this pink zebra tissue paper does) pinch the non-print side and have the design be on the inside. 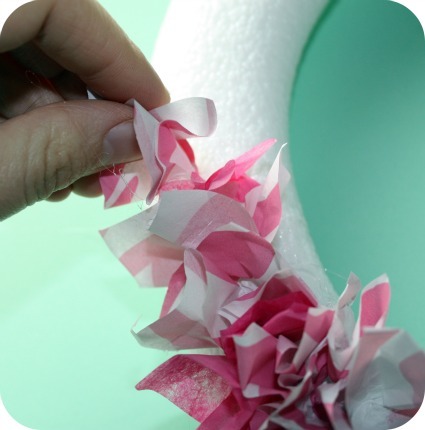 Using your glue gun, add a dab of glue to the pinched ends of each piece of tissue paper and stick onto the Styrofoam wreath. 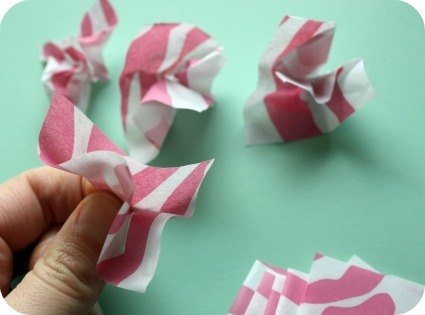 Hold in place with your finger for a few seconds to make sure the tissue paper is secure. Continue adding tissue paper squares until your entire wreath is full. Note: You do not have to cover the back of the wreath if it is going to be hanging of a wall or the front door. I didn't cover the back of mine and you couldn't tell once it was hanging up. Just make sure to go back far enough so it looks like the entire wreath is covered. I made some FREE printable wreath signs that you can print from home and add to the center of your wreath! There are 3 color schemes to choose from: Pink, Blue and Brown. Click on the color swatches below to print the colors that match your baby shower. You will receive both the "Sweet Baby" and the "Welcome" signs.